LAU’s Institute for Women’s Studies hosts an inspiring event to mark International Women’s Day, bringing together dozens of students in a safe, nurturing environment. 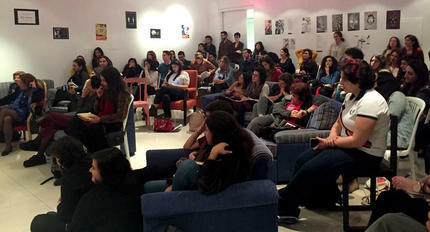 Students, activists, academics and experts in the field gathered at LAU Beirut to attend the event. A student-centered youth-led event hosted yesterday by the Institute for Women’s Studies in the Arab World to mark International Women’s Day brought together more than 100 people in an informal and cozy setting in the Safadi fine arts building at LAU Beirut. “This is one of the best Women’s Day events I have ever attended,” said Hind, a graduate of LAU in the days it was known as the Beirut College for Women. “Unless we talk, things will not change, and you will make that change within your own families, those you are part of now and those you will raise,” she added, directing her comments at the three LAU students who led the discussion on gender and language as part of the event. Theresa Sahyoun, Fatima Al-Ahmad, and Natasha Ghawi spoke about sexism within activist organizations, women in film, and sexual harassment and community conformity respectively. Assistant Professor Dima Dabbous summarized the key points discussed and moderator Nay El Rahi, moved by the students’ statements and praising them for their courage, led a conversation that engaged the audience collectively. This was followed by a living library session during which groups clustered around experts and students to discuss different topics related to gender and language in more detail. “It’s a student-centered event and they have a lot of experience worth sharing and discussing. That’s why we wanted them as part of the living library, where people reference people for answers, like they would a book,” explained Tala Harb, assistant project director at the Institute who headed the organization of the event. Among the living library speakers was LAU student and Model United Nations trainer Paula Nawfal who spoke about her activism on social media and gave examples of the derogatory and aggressive comments she often receives. 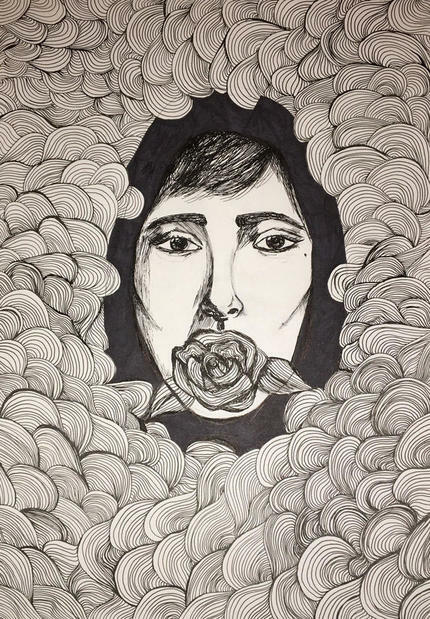 Student and member of the LAU citizenship club Ghawi―who, as part of the living library, focused on the word feminist and its meaning―had earlier read out a post she had prepared for social media but not published because her parents disapproved. “I realize that I was yielding to the same kind of community pressure I fight against as an activist,” she said. Sahyoun, a member of the AUB Feminist Forum, had also spoken eloquently about her personal experience with sexism as a student activist and was invited by one of the many AUB students taking part in the event to join forces with them in addressing the issue. “Young people are already activists and budding academics. They are making their voices heard on the streets and in the classrooms,” noted the director of the Institute Lina Abirafeh. “We owe them our full support. This region in particular has a very young population and the largest gender gap of all regions globally.” Abirafeh summarizes gender inequality in the Arab world in an article published today in the conversation. This event was organized in collaboration with LAU’s citizenship and intersectional feminist clubs, the AUB Feminist Forum, HarassTracker , USJ Women’s Right Club, and the Feminist Network.